Olentangy Liberty’s Mitchell Okuley slices between Dublin Coffman’s Ryan Hamilton (44) and Noah Smith (8) for a touchdown during the first half of Friday’s Division I, Region 2 championship in New Albany. NEW ALBANY – The Olentangy Liberty football team has been here before. The highs are never too high and the lows are never too low. The Patriots did it the same way they’ve done it all before: by putting their heads down and getting to work. 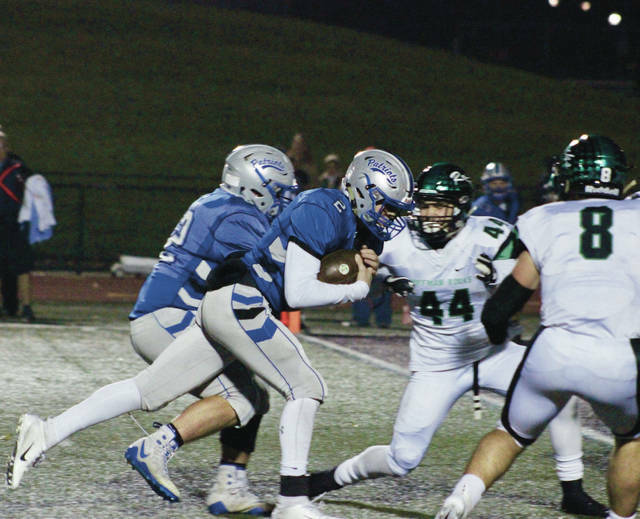 Senior Mitchell Okuley ran for three touchdowns to help fourth-seeded Liberty knock off second-seeded Dublin Coffman 21-7 Friday night to capture the Patriots’ third straight Division I, Region 2 championship. Outside of an Okuley 44-yard touchdown run, Liberty was stymied offensively all night in its 10-0 regional semifinal win over top-seeded Reynoldsburg. So, when Coffman punter Joey Mitchell pinned the Patriots inside their own 10 on three straight punts – the prospect of going the length of the field was daunting to say the least. Thankfully, Okuley brought his carving knife. He completed a 6-yard pass to Aidan Kenley and a 14-yard pass to Mitchell Kershner to start the drive. He found Jake Sincek for a 17-yard gainer two plays later and then Kyle Wilson for 16 more on the following play. Okuley completed his fifth pass to Kershner for a gain of 21 after a 9-yard Kenley run. Then, Okuley seemingly went back to pass a sixth time, but took off instead for an 8-yard touchdown run to give the Patriots a 7-0 lead with 6 seconds left in the first quarter. Okuley ended up completing 13 of 17 passes for 171 yards and added 66 yards on 13 carries on the ground. Kershner was his top target with five receptions for 81 yards. Grant Wilson and Kershner each had second half interceptions that were capped by Okuley 2-yard touchdown runs for the Patriots (9-4), who picked up their first win over Coffman in nine tries. Coffman was held to just 52 yards rushing on 27 carries as a team. Brown finally got the Rocks (11-2) on the board with a 10-yard touchdown pass to Matt Dorenkott with 2:09 left in the game. The touchdown broke a 10-quarter shutout streak for the Patriots. Brown went 18-for-30 for 184 yards. Bryce Hostetler had 58 yards on four receptions and Alex Dluzynski caught six passes for 38 yards to lead Coffman. Liberty faces Lakewood St. Edward in the state semifinal Friday night at 7 p.m. at a neutral site to be determined.